1. Determining a class and subclass of a MAb, as well as the ability to bind and activate complement, are major MAb parameters that affect its performance in the desired application. As such, early and definitive testing of MAbs for these parameters is an essential part of the hybridoma selection process. 2. Multiple isotyping kits are available commercially, ranging from the more than 50 yr old Ouchterlony immunodiffusion agar-based assays to the highly sensitive ELISA tests, for identifying class and subclass composition in different species. In the vast majority of cases, all these kits provide reliable qualitative data, and, therefore, can be used in both primary and advanced screening. 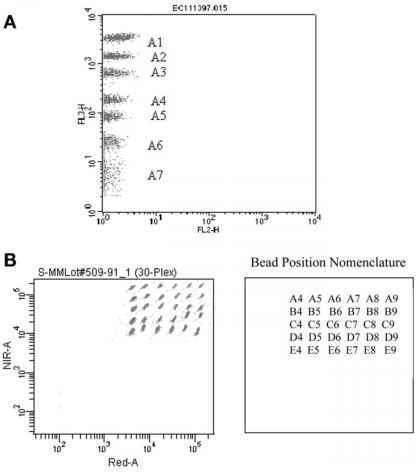 One example of such a simple, inexpensive, quick (less than 1 h), and adequately sensitive (1 ^g/mL) kit is Sigma's Immunotype ISO1 Mouse Monoclonal Antibody Isotyping Kit based in incubating nitrocellulose membrane strips bound to inert support with 2 mL of the supernatant in question, followed by secondary detection using a self-descriptive avidin-biotin detection system. Although more than 90% of murine immunoglobulins contain K light chains, the K vs X light structure should be also determined for each MAb. 3. Test the ability of the MAb in question to fix and activate complement using rabbit low-Tox-M complement from Cedarlane Laboratories (see Subheading 2.). First, make sure the concentration of the MAb in the tested material (typically, hybridoma supernatant from 24-well plates) is equal or greater that 1 p,g/mL. Quantitate MAb concentration in ELISA using the Standard Vectastatin ABC kit according to the manufacturer's recommendations. If needed, adjust the supernatant to pH 7.2-7.4. Incubate 106 washed viable target cells exposing the antigen in question on their membrane with 1 mL of the hybridoma supernatant at 4°C for 1 h or complete hybridoma medium (negative control). After two washes in pre-warmed serum-free medium, incubate target cells with 1 mL of prediluted rabbit complement at the concentrations recommended by the manufacturer for the complement lot used in the experiment. After incubation, immediately determine the percentage of cell death in the hybridoma supernatant vs the negative control sample. This experiment must be repeated at least three times with different lots and concentrations of the complement.